Show and Tell Meg: Scotch Gard All The Things! Scotch Gard All The Things! As I mentioned in my Camera Shoes post, I have recently fallen in love with Scotch Gard. Back in my heavy-couponing days, I used to request every freebie the internet could provide, and I got lucky with scoring a full can of Suede & Nubuck Protector and Leather Shoe Guard. At the time, I had not suede shoes to even test it out on, so the can sat in my freebies bucket until this past month when I came across it. I have 2 pair of suede shoes now - one pair which is ruined from several unannounced Florida rainstorms, and one pair that I am consequently afraid to wear in case of said storms. You really just never know when it will rain here, but it usually always does when I decide to wear suede shoes. Since I planned on Scotch Gard-ing my Camera shoes anyway, I decided to use all of these products on several items I felt needed a bit of babying, and I did it all at the same time. 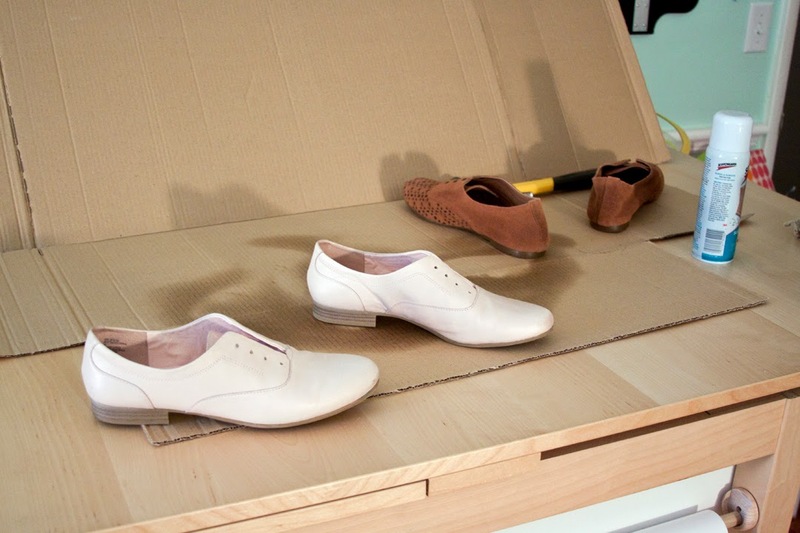 While the fabric items were drying between coats, I took care of my White Mountain Ballet Pink Leather Oxfords and my Lucky Brand Suede Cut Out Toe Oxfords. The pink oxfords are leather, but they are definitely cheap leather. I've worn them a few times and if they even get a drop of water on them they puff up and turn a weird dark color - not a good sign. The suede ones were just awesome and I wanted to protect them from the fate of my other suede shoes. Each of these shoes got 2 coats of product. I know it's probably silly to post about this on my blog, but I honestly feel I've gained 5 new items for my wardrobe after this simple process. .I put off using Scotch Gard for a long time because I was afraid it would be a hassle or make a mess - man was I wrong! This was so easy to do, and I am so glad I finally bit the bullet and got it done. *I was in no way compensated for this blog post by Scotch Gard - though I did receive the Suede and Leather products for free though a completely unrelated random giveaway several years ago. All these opinions are 100% my own.